With thanks to Nancy Wadsworth for providing the postcard. A small token of remembrance to show my appreciation to the Overlookers of the Spinning Department of T & M Bairstow for the way in which they received me into their midst 1926-28. Chris Firth identified his grandfather William Firth, aged 38, third from the right on the back row. 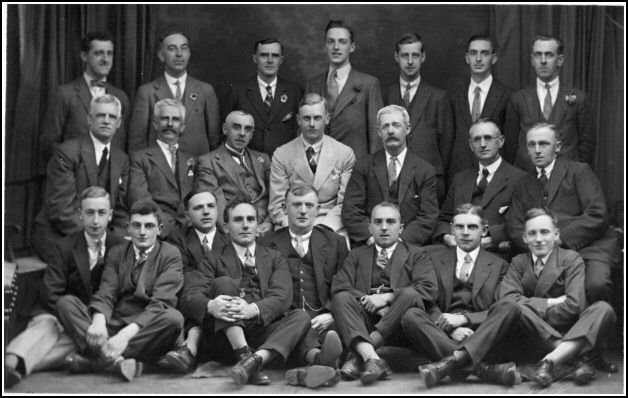 Rita Chadwick (nee Overend) identified her father, Clifford Overend aged 22, as the tall man in the middle of the back row. Anne Newman (nee Wigglesworth) identified the overlooker on the far right of the middle row as her grandfather Robert (Bob) Wigglesworth.